Author: Philip Wolfson, M.D. 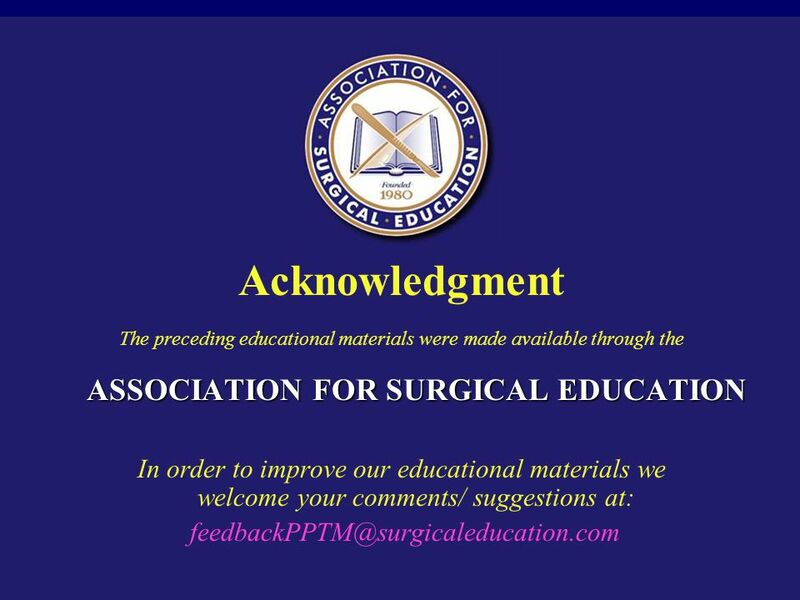 Jefferson Medical College Revision Editor: Linda Barney, M.D. Joseph Iocono, M.D. 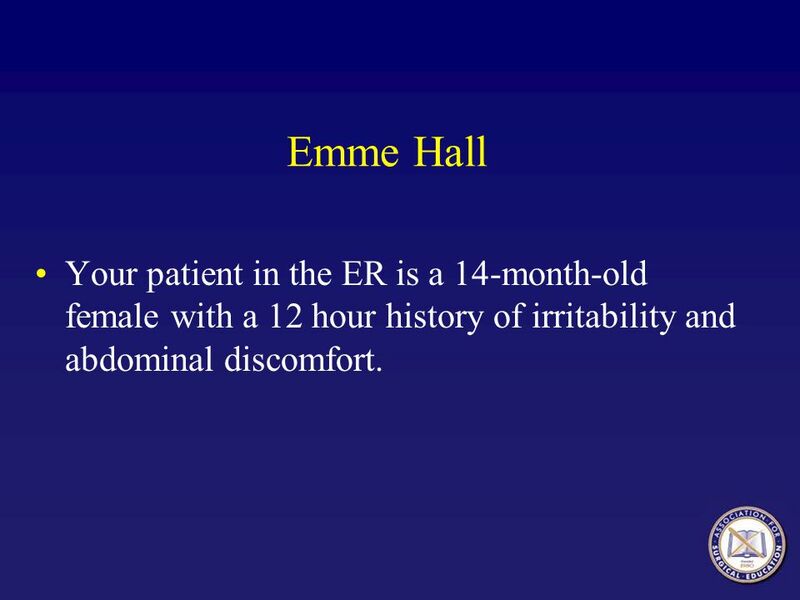 2 Emme Hall Your patient in the ER is a 14-month-old female with a 12 hour history of irritability and abdominal discomfort. 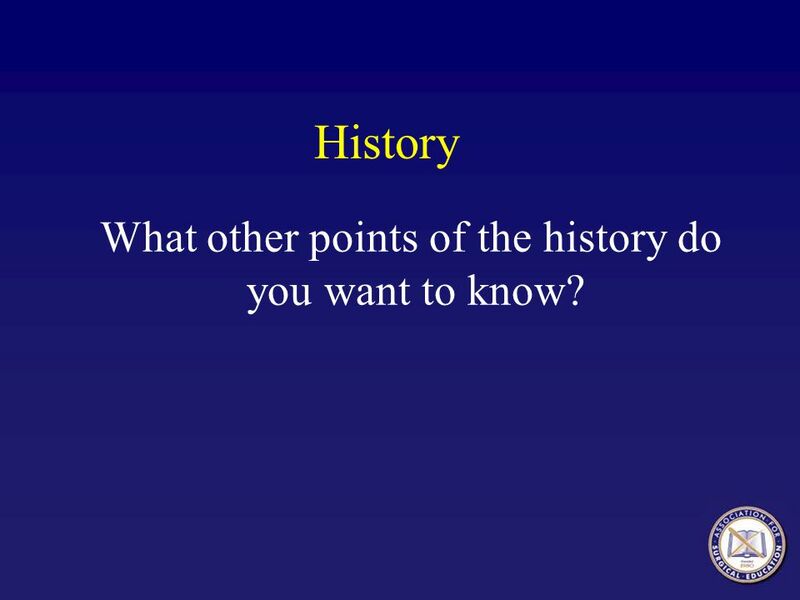 3 What other points of the history do you want to know? 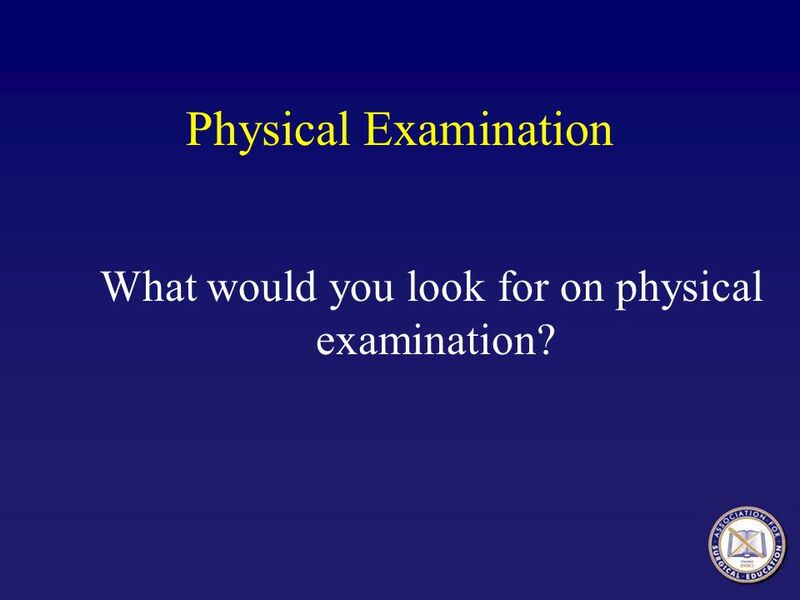 6 What would you look for on physical examination? 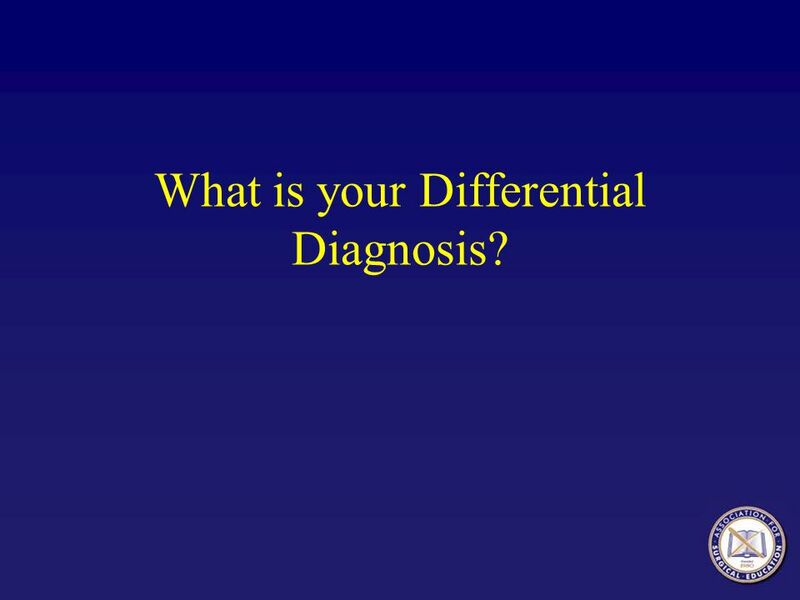 8 What is your Differential Diagnosis? 9 What studies would you obtain? 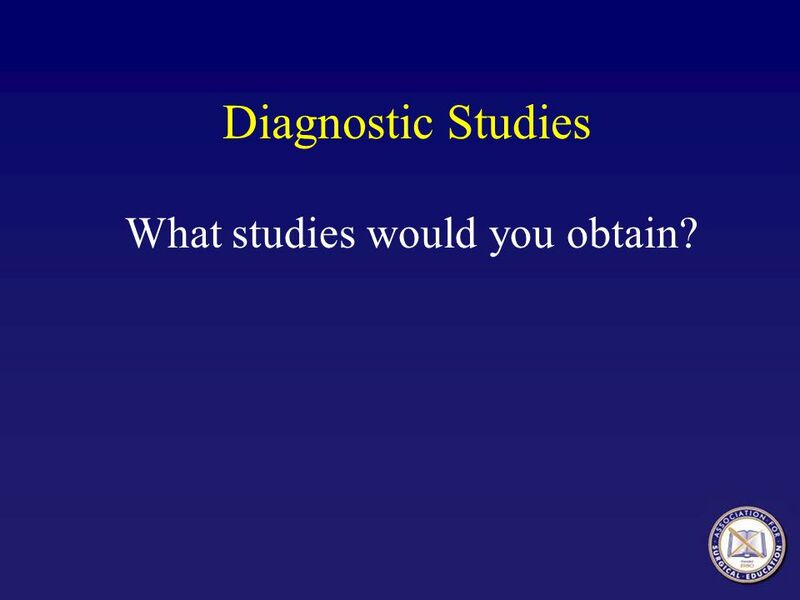 Diagnostic Studies What studies would you obtain? 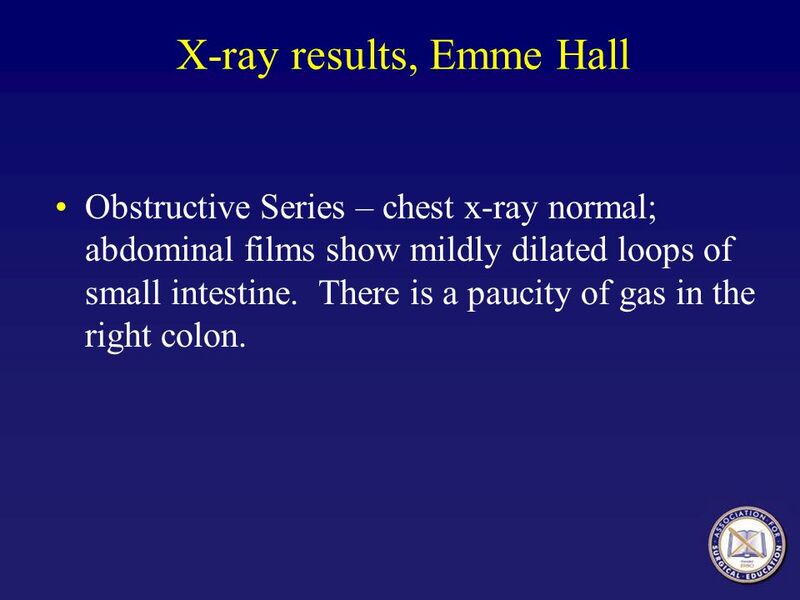 Obstructive Series – chest x-ray normal; abdominal films show mildly dilated loops of small intestine. There is a paucity of gas in the right colon. 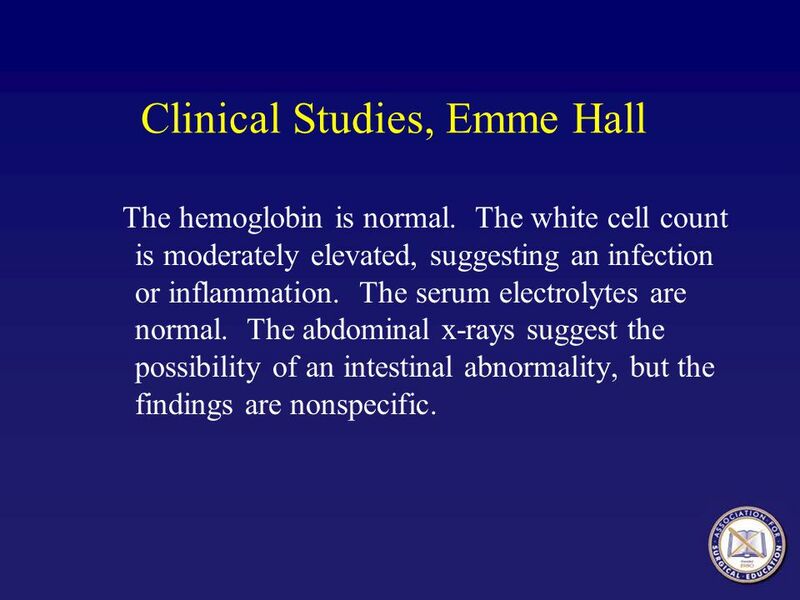 The hemoglobin is normal. The white cell count is moderately elevated, suggesting an infection or inflammation. 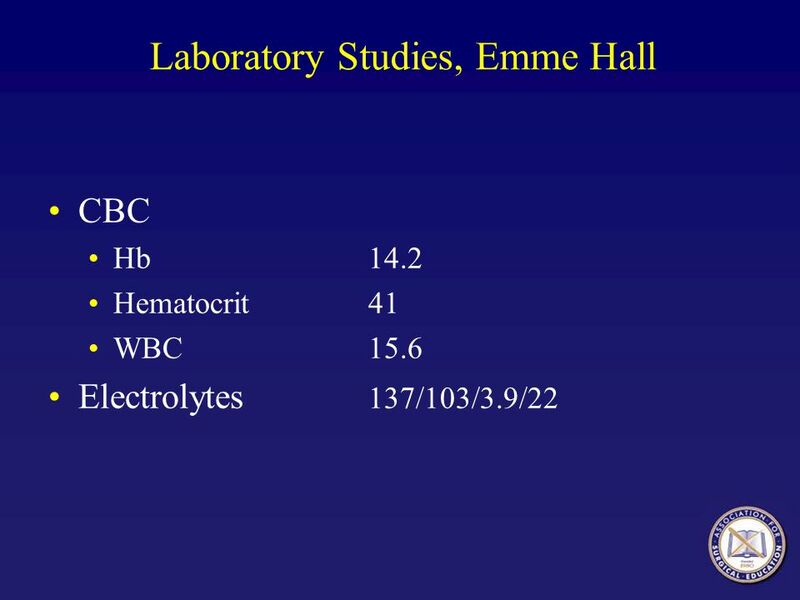 The serum electrolytes are normal. The abdominal x-rays suggest the possibility of an intestinal abnormality, but the findings are nonspecific. 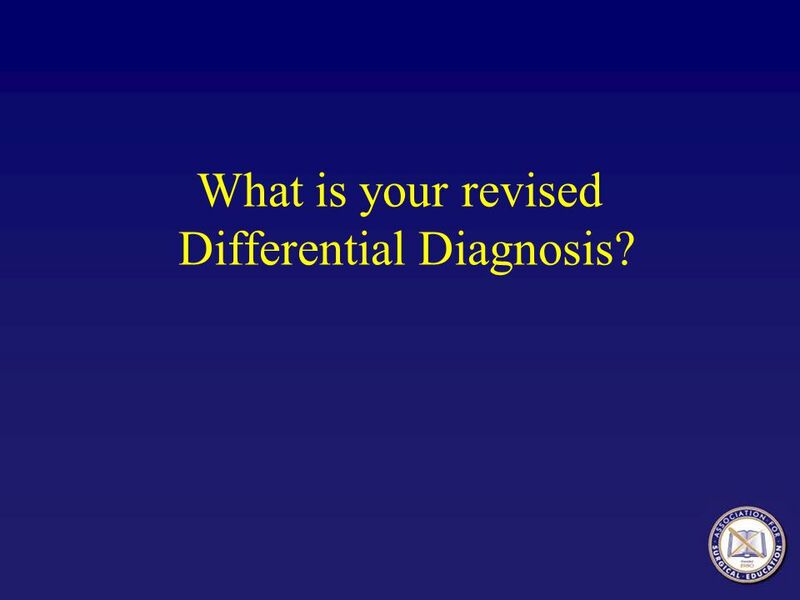 14 What is your revised Differential Diagnosis? 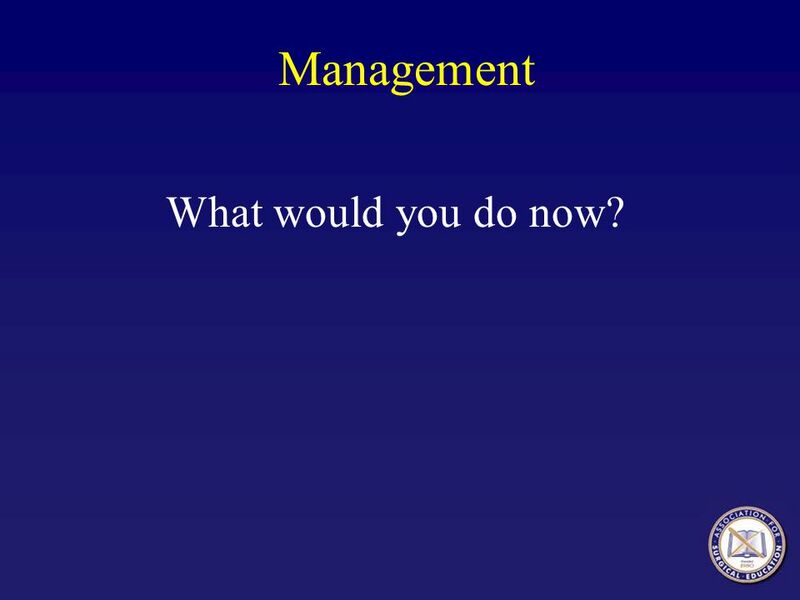 16 Management What would you do now? 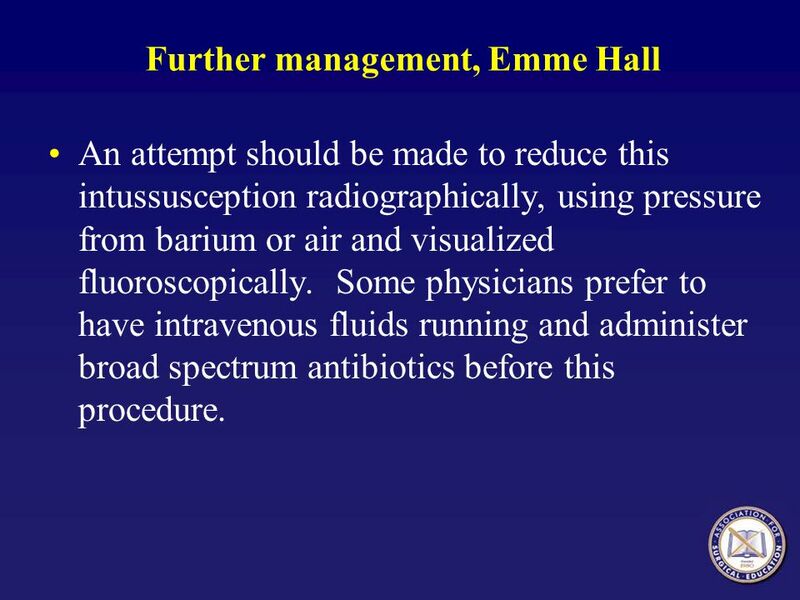 An attempt should be made to reduce this intussusception radiographically, using pressure from barium or air and visualized fluoroscopically. Some physicians prefer to have intravenous fluids running and administer broad spectrum antibiotics before this procedure. 19 Air enema The air passes up through the large intestine until it reaches the right side of the transverse colon where it encounters a filling defect. 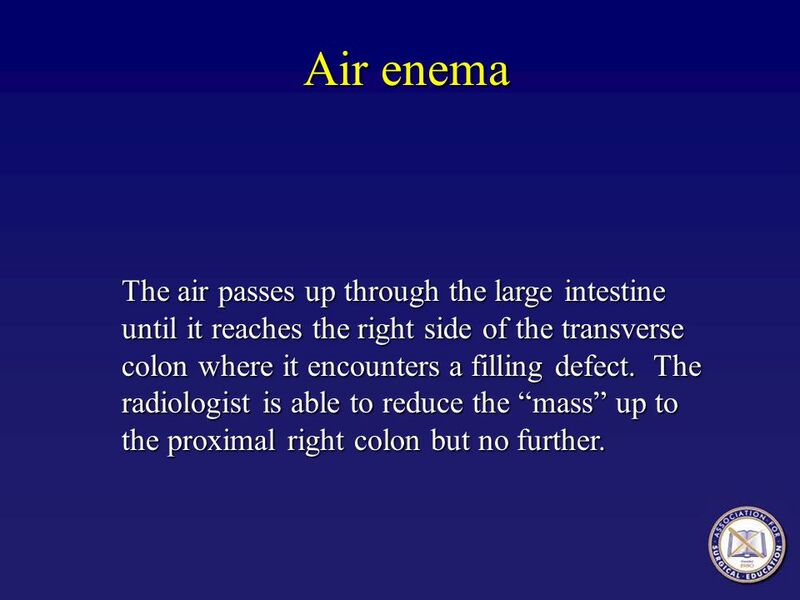 The radiologist is able to reduce the “mass” up to the proximal right colon but no further. 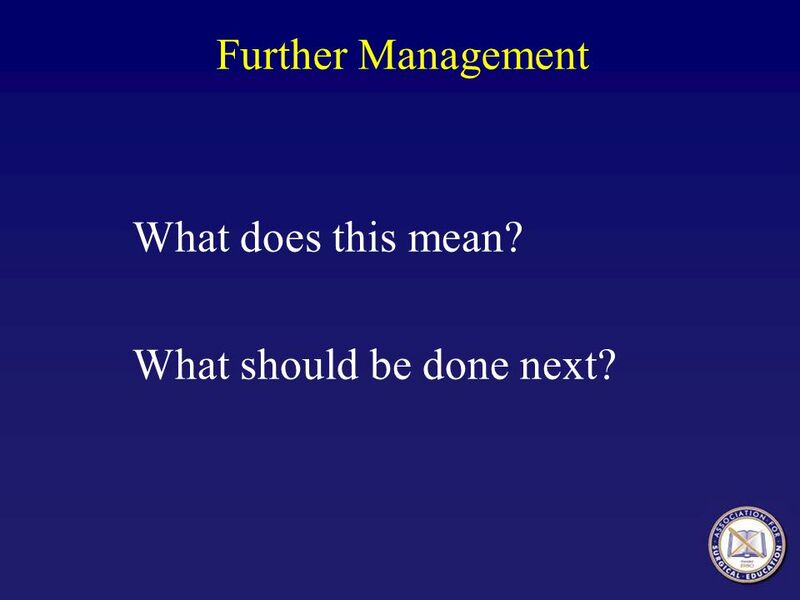 20 Further Management What does this mean? What should be done next? 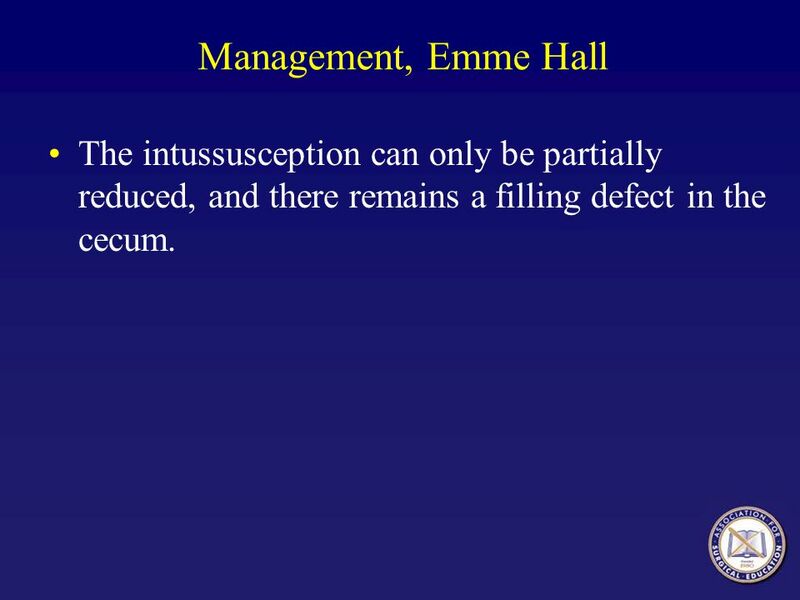 21 Management, Emme Hall The intussusception can only be partially reduced, and there remains a filling defect in the cecum. 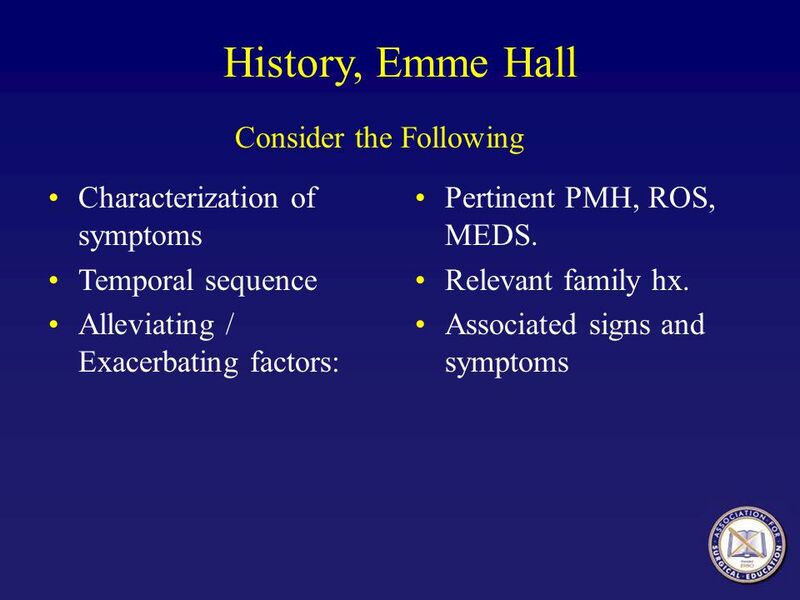 22 Management, Emme Hall Since the intussusception cannot be reduced, surgery is necessary and should be performed immediately. Broad spectrum antibiotics effective for lower intestinal organisms should be administered preoperatively. 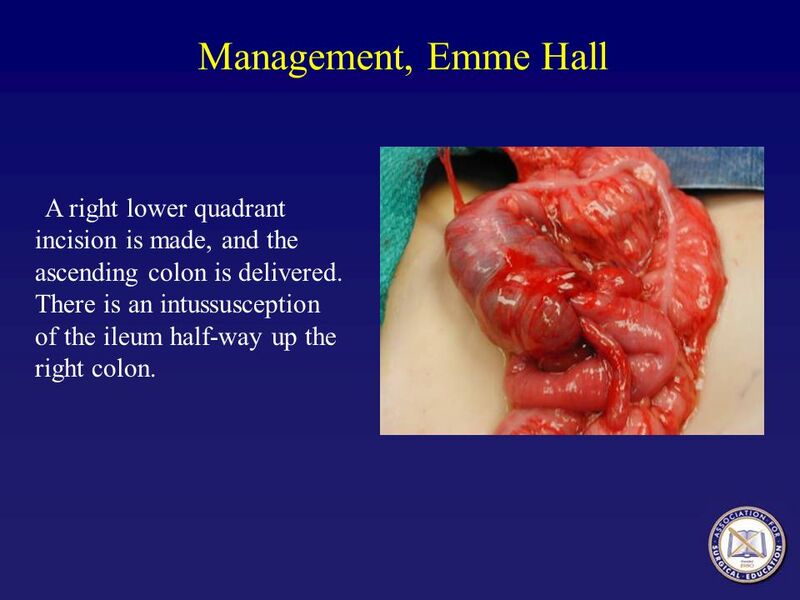 23 Management, Emme Hall A right lower quadrant incision is made, and the ascending colon is delivered. 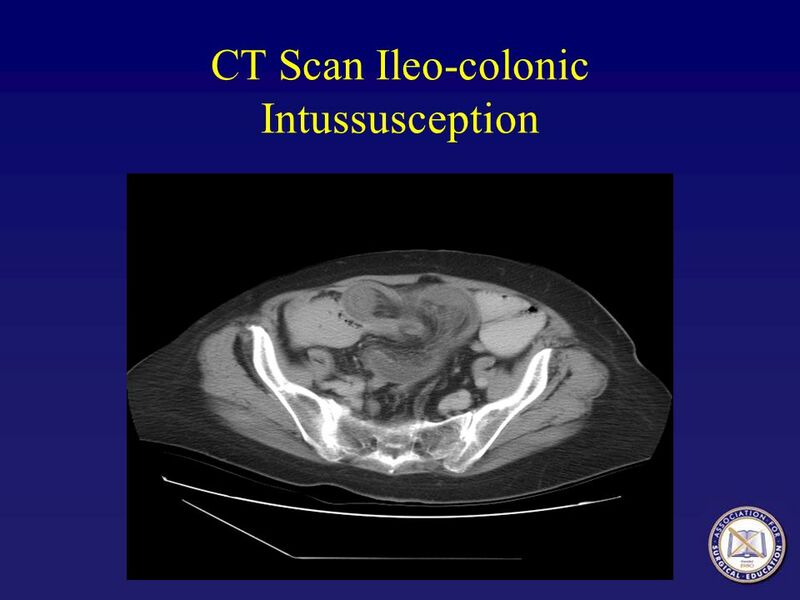 There is an intussusception of the ileum half-way up the right colon. 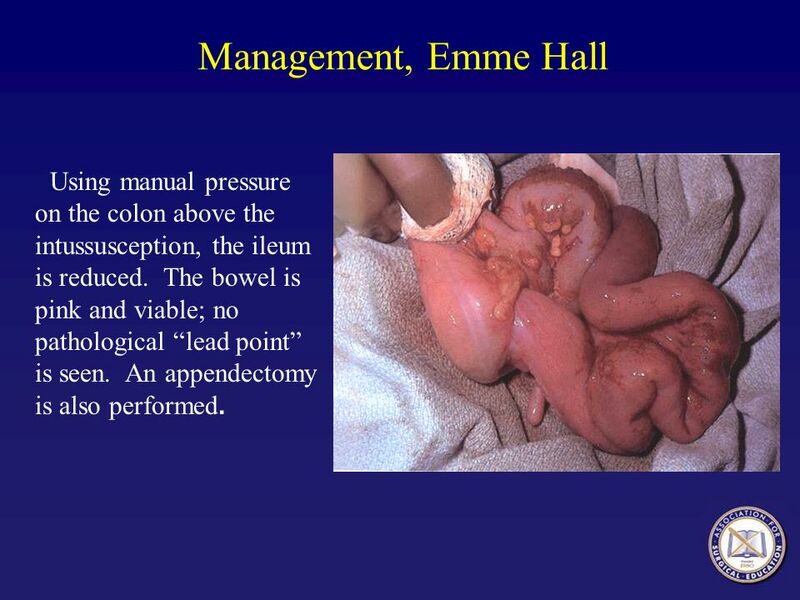 24 Management, Emme Hall Using manual pressure on the colon above the intussusception, the ileum is reduced. The bowel is pink and viable; no pathological “lead point” is seen. An appendectomy is also performed. 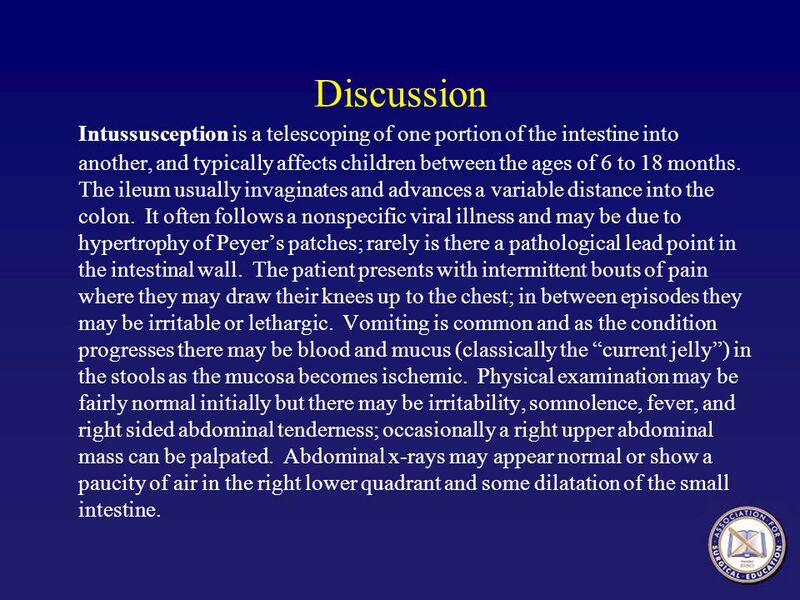 26 Discussion Intussusception is a telescoping of one portion of the intestine into another, and typically affects children between the ages of 6 to 18 months. The ileum usually invaginates and advances a variable distance into the colon. It often follows a nonspecific viral illness and may be due to hypertrophy of Peyer’s patches; rarely is there a pathological lead point in the intestinal wall. The patient presents with intermittent bouts of pain where they may draw their knees up to the chest; in between episodes they may be irritable or lethargic. Vomiting is common and as the condition progresses there may be blood and mucus (classically the “current jelly”) in the stools as the mucosa becomes ischemic. 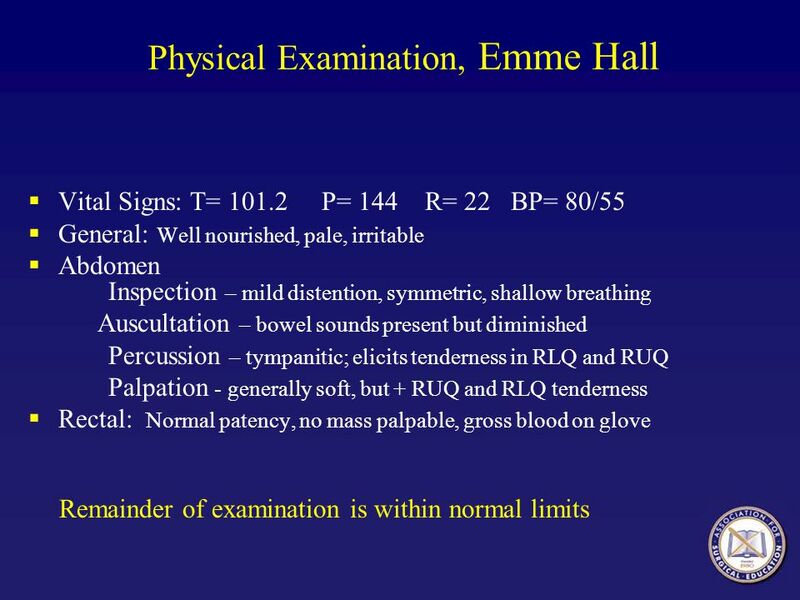 Physical examination may be fairly normal initially but there may be irritability, somnolence, fever, and right sided abdominal tenderness; occasionally a right upper abdominal mass can be palpated. Abdominal x-rays may appear normal or show a paucity of air in the right lower quadrant and some dilatation of the small intestine. 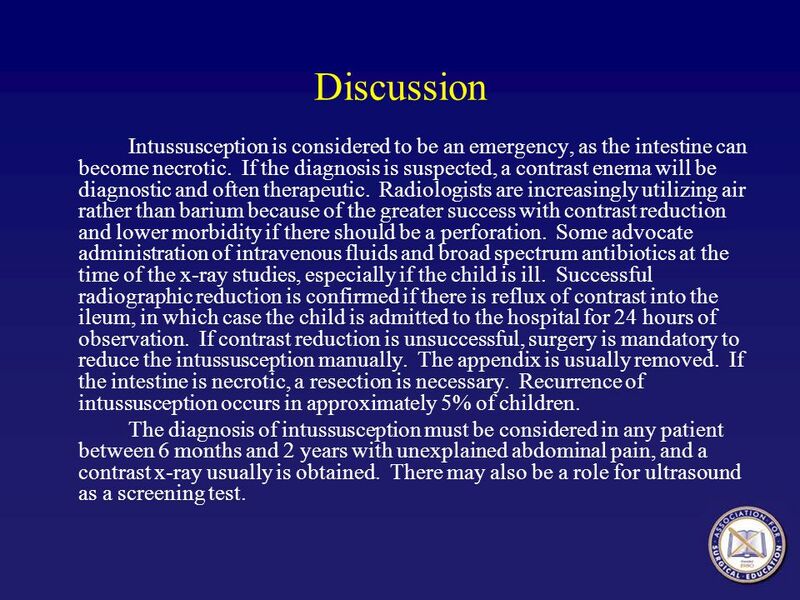 27 Discussion Intussusception is considered to be an emergency, as the intestine can become necrotic. If the diagnosis is suspected, a contrast enema will be diagnostic and often therapeutic. Radiologists are increasingly utilizing air rather than barium because of the greater success with contrast reduction and lower morbidity if there should be a perforation. Some advocate administration of intravenous fluids and broad spectrum antibiotics at the time of the x-ray studies, especially if the child is ill. 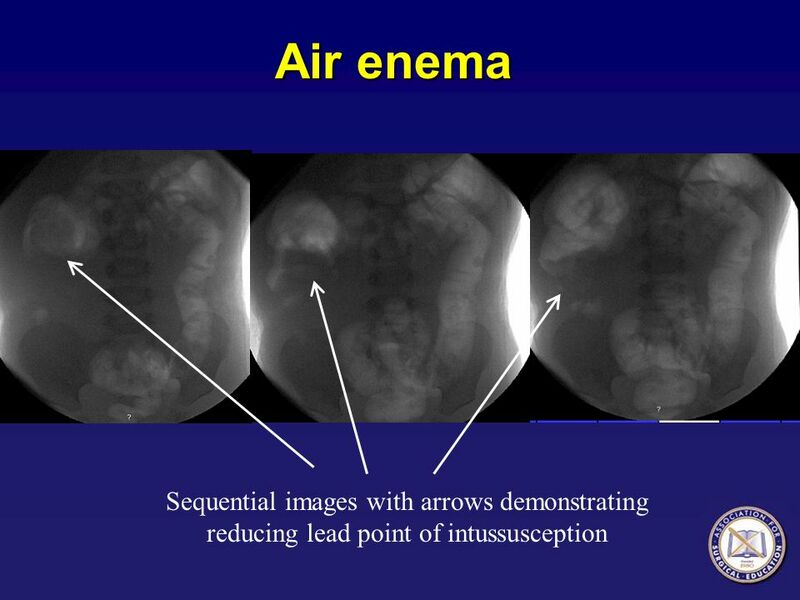 Successful radiographic reduction is confirmed if there is reflux of contrast into the ileum, in which case the child is admitted to the hospital for 24 hours of observation. 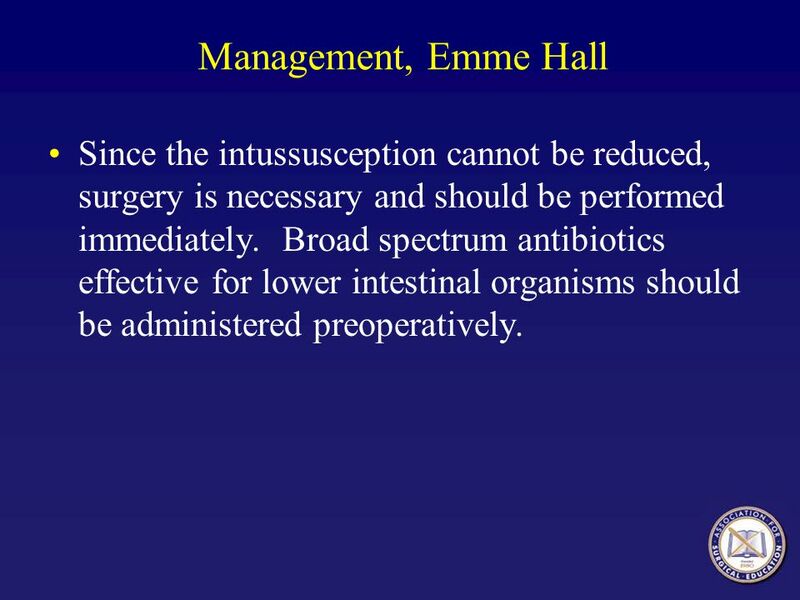 If contrast reduction is unsuccessful, surgery is mandatory to reduce the intussusception manually. The appendix is usually removed. If the intestine is necrotic, a resection is necessary. 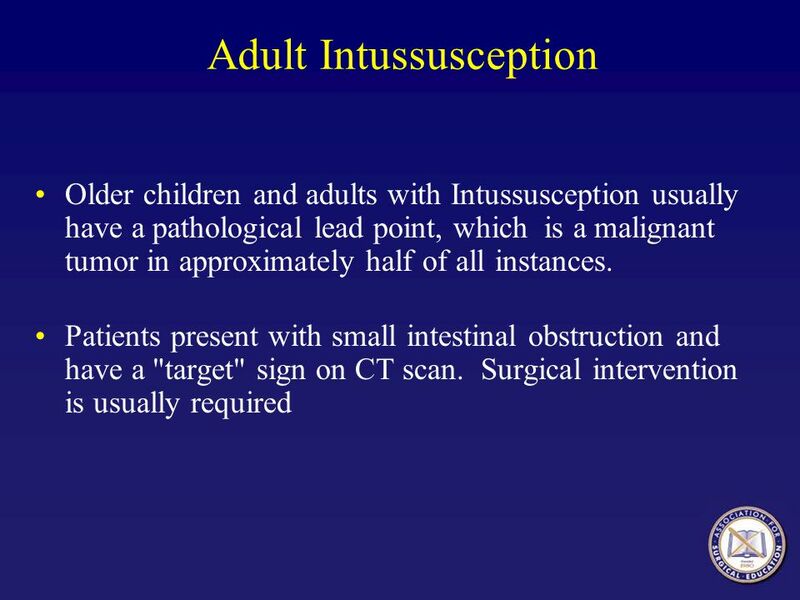 Recurrence of intussusception occurs in approximately 5% of children. 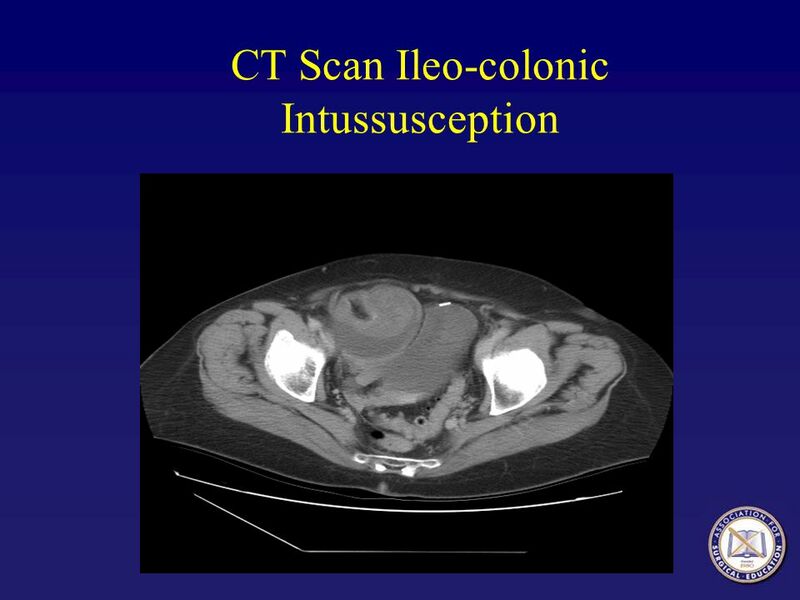 The diagnosis of intussusception must be considered in any patient between 6 months and 2 years with unexplained abdominal pain, and a contrast x-ray usually is obtained. There may also be a role for ultrasound as a screening test. 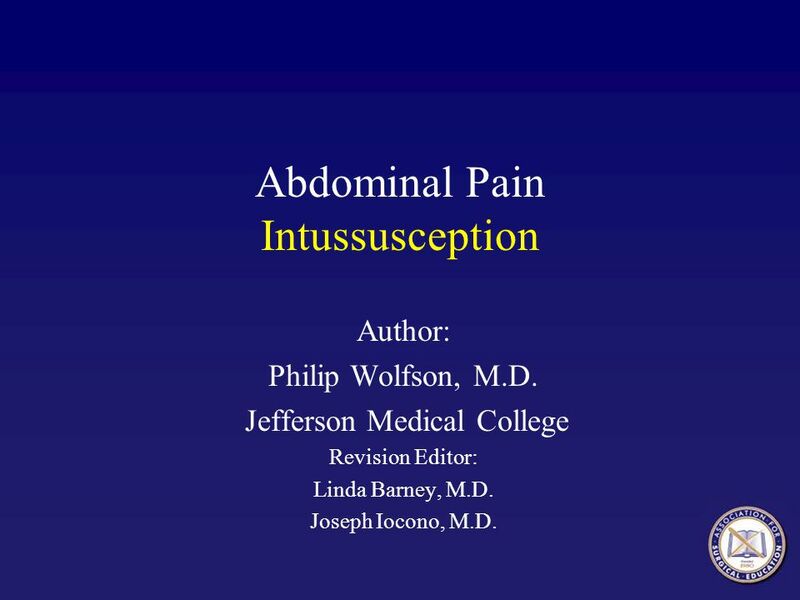 Download ppt "Abdominal Pain Intussusception"
Diagnostic Work-up. 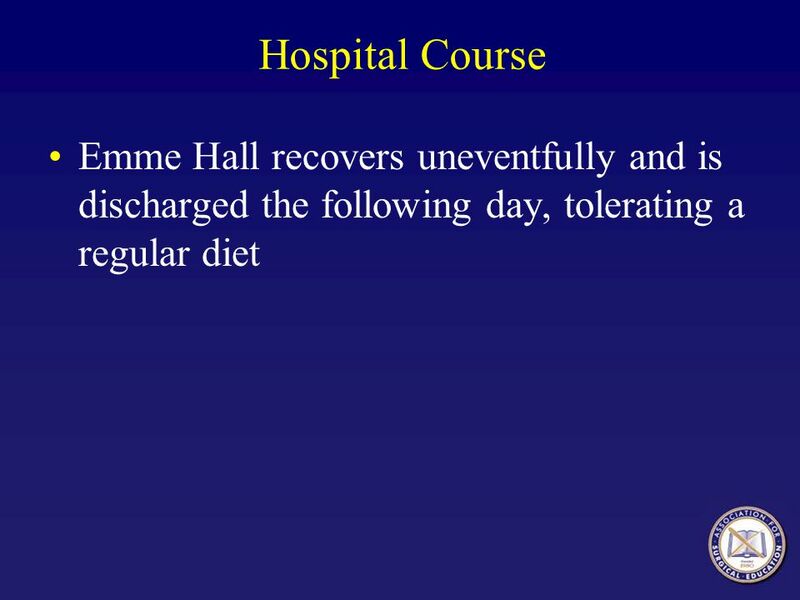 There is no specific laboratory or imaging test to diagnose irritable bowel syndrome. 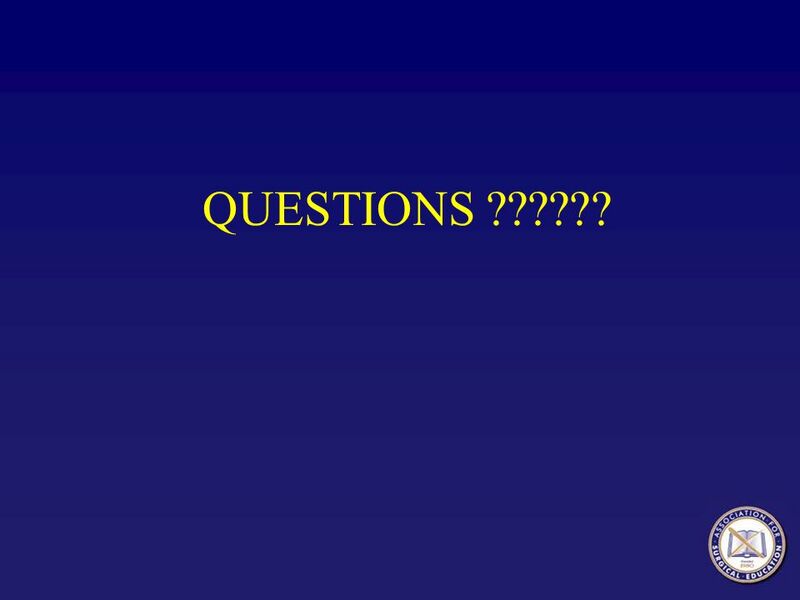 Currently the diagnosis of IBS relies on meeting. 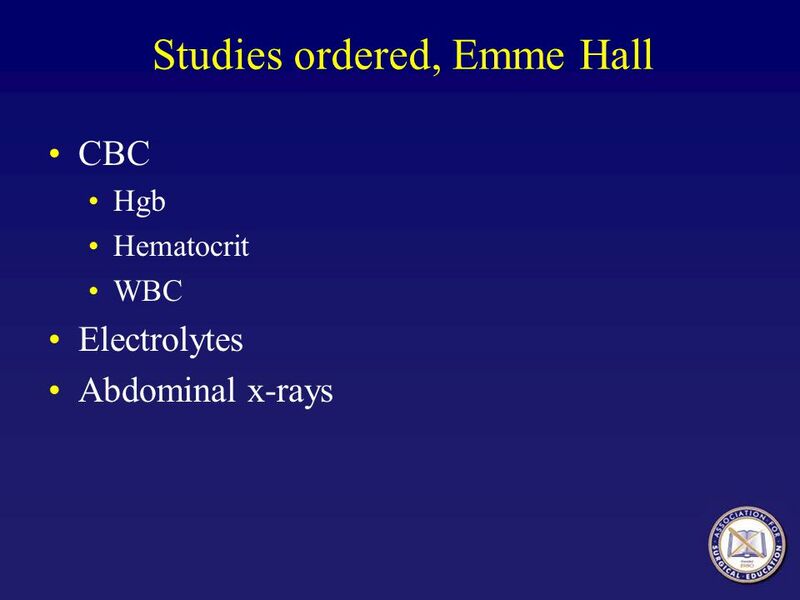 Breast Mass Linda M. Barney, MD Wright State University. Joint Hospital Grand Round Topic : Adult Intussusception Dr. Eric Lai Department of Surgery Prince of Wales Hospital. 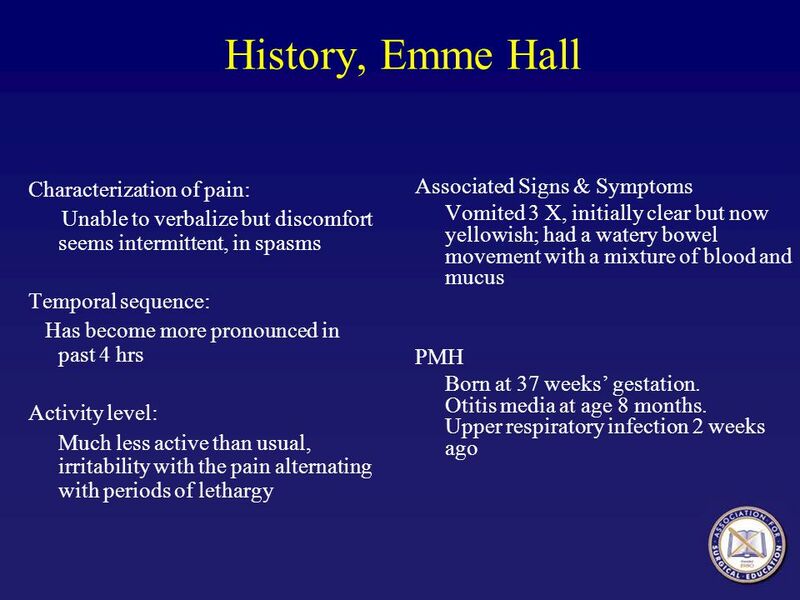 History Age: 17 months History: Female infant with recent history of low grade fever. Presented to the ER on August 8th with increasing episodes of intermittent. THE ACUTE ABDOMEN Patients with an acute abdomen comprise the largest group of people presenting as a general surgical emergency. In most acute abdominal. 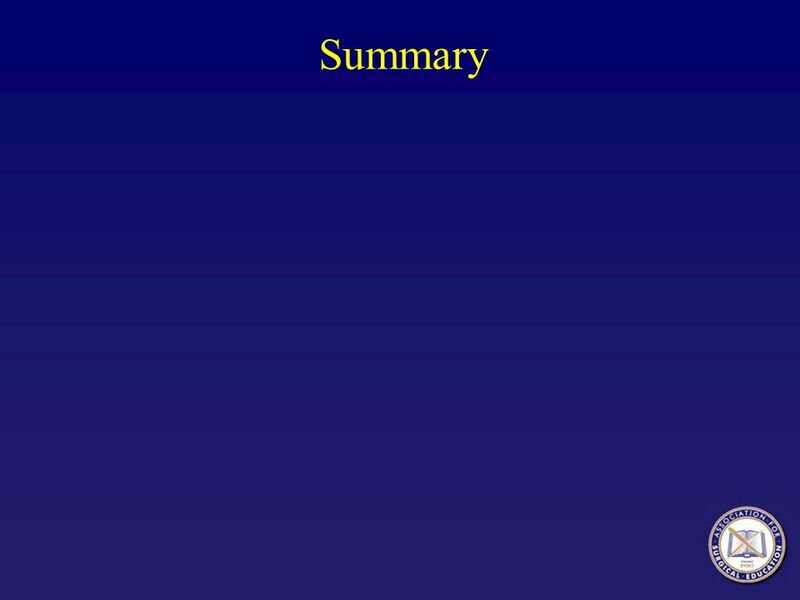 NYU Medical Grand Rounds Clinical Vignette Rennie Rhee MD, PGY-2 January 13, 2010 U NITED S TATES D EPARTMENT OF V ETERANS A FFAIRS. *Welcome to your* Appendix/Cecum ~Presented by~ Your very own Brittany Phillips. CASE: RLQ Pain A 17 year old otherwise healthy female presents to the University Hospital emergency department with a 12 hour history of fever and abdominal. 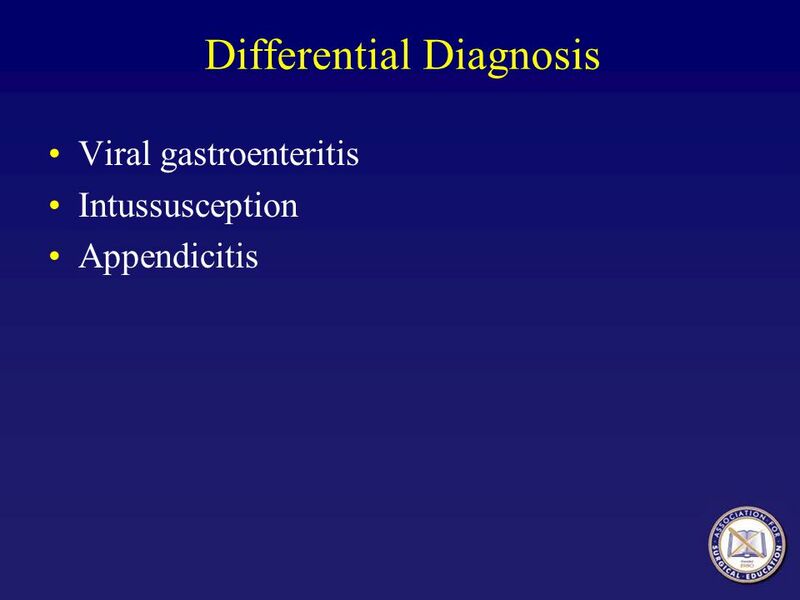 Diverticular disease of the colon Presented by J. Karl Pineda.